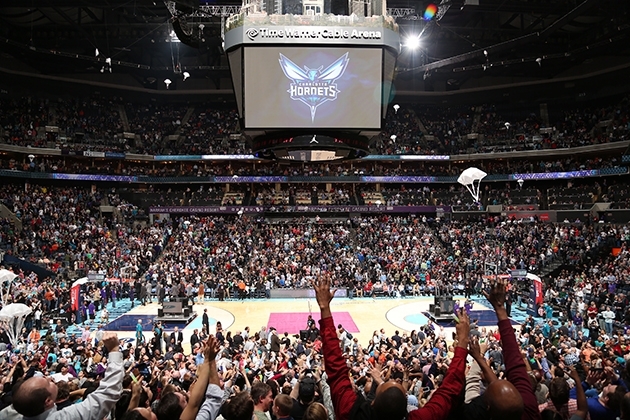 Originally established in 1988 as an expansion team in the NBA, the Charlotte Hornets became one of the league’s most exciting teams — best demonstrated by an impressive streak of 364 consecutive sold-out home games — in the 1990s until the start of the 2002 season when the team was relocated to New Orleans (then evacuated to Oklahoma City for two seasons after Hurricane Katrina) where they remained called the Hornets until the start of the 2013 season when they changed their name to the New Orleans Pelicans. Meanwhile, at the start of the 2004 season, Charlotte got yet another expansion team going, the Charlotte Bobcats, whose only interesting news since has been that Michael Jordan became its majority owner in 2010 and at the end of 2013, during the halftime of a recent home game, Jordan announced the return of the Hornets name to Charlotte, now that New Orleans had stopped using it. The Bobcats will change their name for the 2014/15 season and will start using the new identity designed “in a collaborative effort between Bobcats team executives, the NBA’s Global Merchandising Group and Jordan Brand, a division of Nike”. Previous logos: As the Charlotte Hornets from 1989/90 – 2001/02 seasons, as the New Orleans Hornets from 2002/03 – 2007/08 seasons, and as the New Orleans Hornets from 2008/09 – 2012/13 seasons. Reintroducing the Charlotte Hornets. Animation (or “sizzle”) by Troika. Pump up the volume, y’all! The new logo system pyramid. The original Hornets logo is one of the reasons I became a graphic designer even though I had no idea at the time but I used to draw it over and over because it was so cool and different from other NBA logos then. That doesn’t mean it was the best logo, but it had an attitude. Hugo, the hornet, was cool. The new primary logo is more in tune with the New Orleans Pelicans genre of sports logos: the angry, angular mascot. The drawing of the hornet is precise and energetic with the typography decently embedded into it and the obligatory basketball well integrated in the body of the hornet. The symmetrical approach will play much better than the tilted position of the original logo and way better than the speeding-train-bobcat-head it replaces. There is also a secondary logo that is a direct evolution of the original logo to be used only as the mascot logo for Hugo. A smart way to give fans what they want — their old glory-days team back — but without compromising the idea of a fresh start through the primary logo. I also bet that any merchandise with this logo will outsell anything with the new logo. Now here is where things start getting complex. Most professional sports team have alternate logos and the Hornets have introduced not just the mascot logo above but two other alternate logos: the hornet in profile above and the hornet front view below without the wordmark, not to mention the silhouette of the hornet also below. It’s good to have flexibility and variations on a logo but this seems to have the potential of being confusing and misused pretty quickly. Nonetheless, the profile hornet is may favorite of the bunch. Quaternary logo of some kind of something, dubbed the “Crown CH” logo. Quaternary logo of the hornet on its own. Quaternary logo for “Buzz City”. Launch event. More images here. The Crown CH and Buzz City logos look like such afterthoughts that I would have cut off the pyramid graphic at the third tier. They feel too forced and almost unnecessary to pimp on launch but on the flip side I can see how it would be beneficial to get the fans ready for changes in 6 to 8 months. Overall, a good redesign within the confines of modern-day NBA logos. Now, if we could get that trio of Mourning-Grandmama-Bogues back, that would be truly buzz-worthy. Thanks to Kahlief Steele for the tip. Originally established in 1988 as an expansion team in the NBA, the Charlotte Hornets became one of the league's most exciting teams — best demonstrated by an impressive streak of 364 consecutive sold-out home games — in the 1990s until the start of the 2002 season when the team was relocated to New Orleans (then evacuated to Oklahoma City for two seasons after Hurricane Katrina) where they remained called the Hornets until the start of the 2013 season when they changed their name to the New Orleans Pelicans. Meanwhile, at the start of the 2004 season, Charlotte got yet another expansion team going, the Charlotte Bobcats, whose only interesting news since has been that Michael Jordan became its majority owner in 2010 and at the end of 2013, during the halftime of a recent home game, Jordan announced the return of the Hornets name to Charlotte, now that New Orleans had stopped using it. The Bobcats will change their name for the 2014/15 season and will start using the new identity designed \"in a collaborative effort between Bobcats team executives, the NBA's Global Merchandising Group and Jordan Brand, a division of Nike\".